About the company: Aplava derives its name from sanskrit origins. Aplava (pronounced “AAp luv” in original sanskrit) means taking a bath to purify oneself. It’s an ablution process of cleansing oneself. Just as the name suggests, Aplava wants to give its customers an experience of divine purity. Beauty is you! As a startup beauty company, we strive to bring an unparalleled assortment of prestige brands, household names and niche, cult beauty brands, all on one site. Our professional team of Dermatologists and Beauty advisors has cherry picked brands across a broad range of product categories including Skincare, Hair care, Bath & Body, Make Up, Fragrance, Sun & Travel, Intimacy, Shaving, Candles and Aromatherapy, Mom & Baby & Homecare. To make your experience worthwhile and easy, the team has developed a mechanism to advice and recommends products based on your skin type and skin concerns. 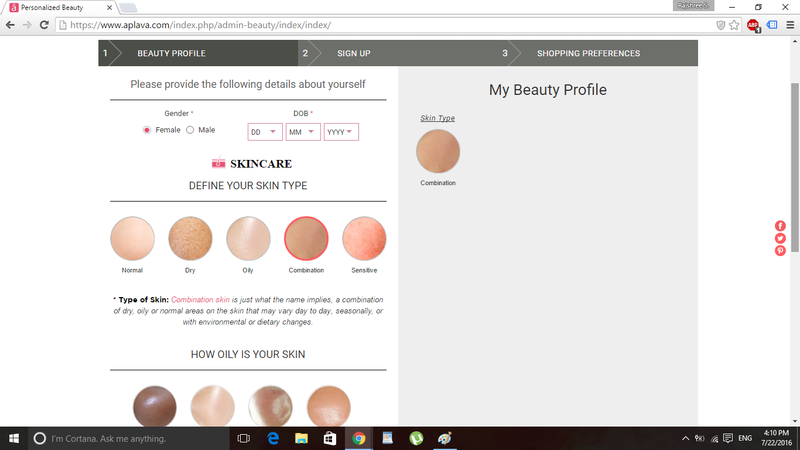 Use the Personalized Beauty section on your profile page to get customized recommendation for your daily skin routine. Unlike many other beauty retailers, we work directly with our manufacturers/authorized distributors to bring you over 5,000 products straight from the brands themselves. You can trust that anything you buy is 100% authentic, guaranteed. To start with, the layout of the website is very clean and crisp. 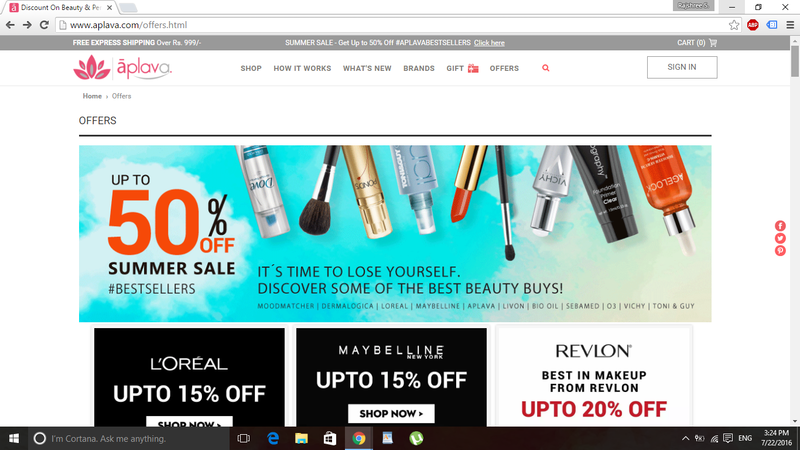 The homepage features 6 self explanatory tabs which include Shop, How it works, What's new, Brands, Gifts, Offers that make the website very user friendly. 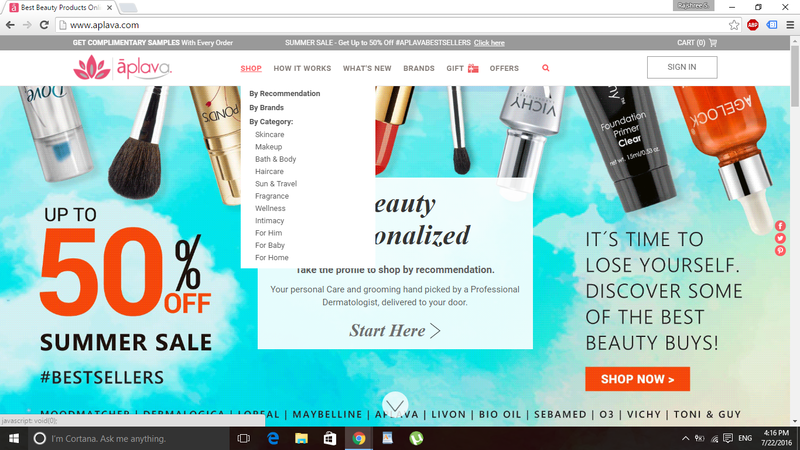 The variety of beauty brands this website had to offer really impressed me. They support famous drugstore to high end, national and international brands like Ren, Dermalogica, Rodial, Lakme, Just Herbs, Dr. Lipp, Loreal, Vichy, O3+, Maybelline, Bottega Di Lungavita, Revlon, Faces and many more. One of the key features provided by Aplava.com is ‘Personalized Beauty‘ which will help you get personalized recommendations from professional dermatologists. To try out this feature all you have to do is log into Aplava.com and click on the Get Started tab on the right hand side corner of your homepage. Once you click on this tab you will be redirected to a quiz which will help you create a personal profile. 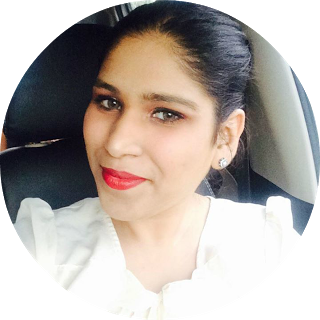 Through this personal profile the system creates an analysis and suggests products as per your skin and hair type. With the help of this quiz their experts will build a customized regime for you to follow. 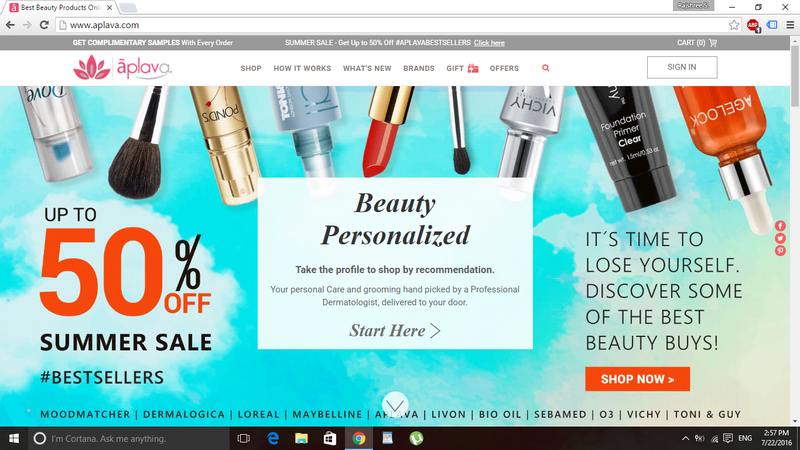 Click here to try the Personalized Beauty Feature. There are discounts available on nearly every product I saw online along with a Free shipping option on all orders above Rs.999. You will earn loyalty points with every purchase that you can redeem on your next purchase. They also provide flexible payment options which include credit/debit card, net banking, PayU money, Paytm and COD facility. 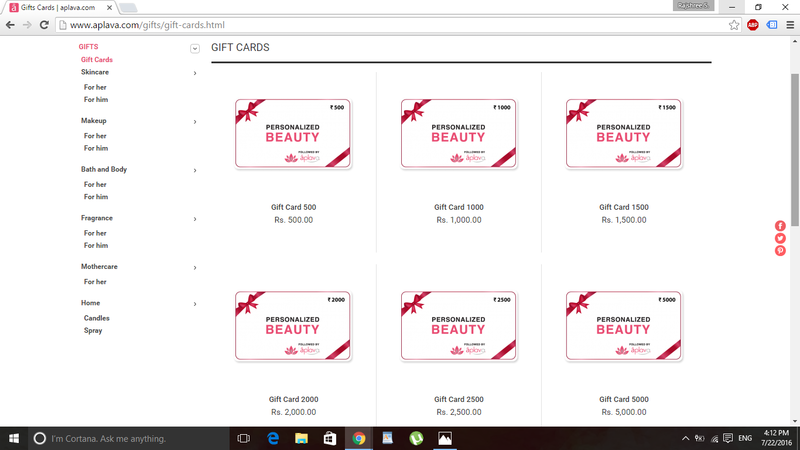 Also, they have personalized beauty gift card options available ranging from Rs. 500- Rs. 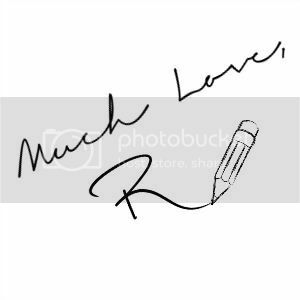 10,000 which will serve as a perfect gift option for your loved ones. Shopping experience: So now coming down to the actual shopping experience. All the products arrived in a sturdy carton and were nicely bubble wrapped. I received the package within a week from the day I had placed the order and all the products were undamaged and intact on arrival. 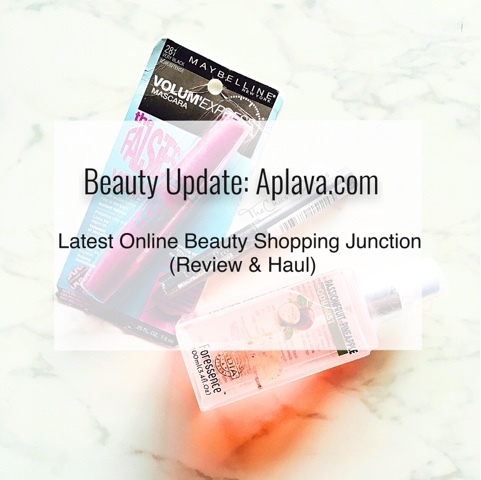 Looking at the spread of brands and products they had to offer I wanted to grab nearly everything on display but since this was a new website I decided to test it first by doing a mini haul. 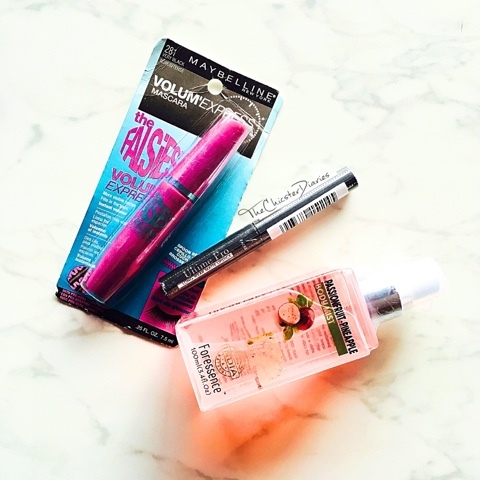 I ended up restocking my makeup favourites - Maybelline Volum' Express Falsies Mascara (Waterproof) and Faces Ultime Pro Long wear matte lipstick in the shade 08 Fig. Also, I had always wanted to try The Nature's Co. Passion Fruit and Pineapple body mist so when I saw it in stock I didn't think twice and added it to my cart. Overall Verdict: All in all, a lovely shopping experience with this online store. 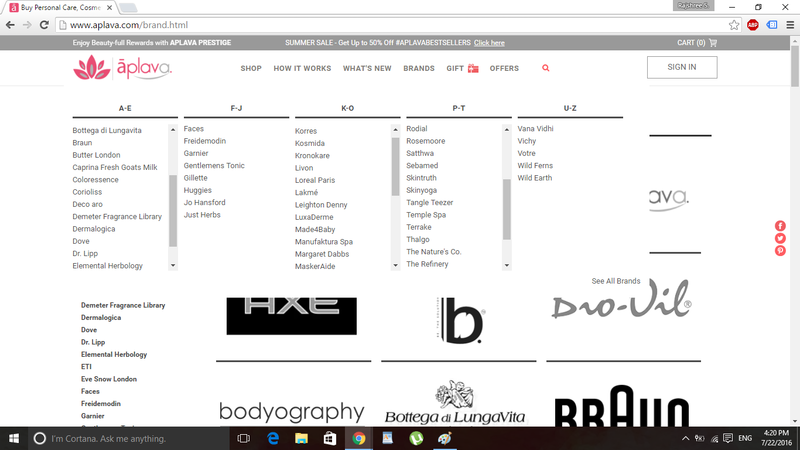 In spite of being new in the market I think they are already giving tough competition to some of the well known online shopping brands. Hope you enjoyed this post. 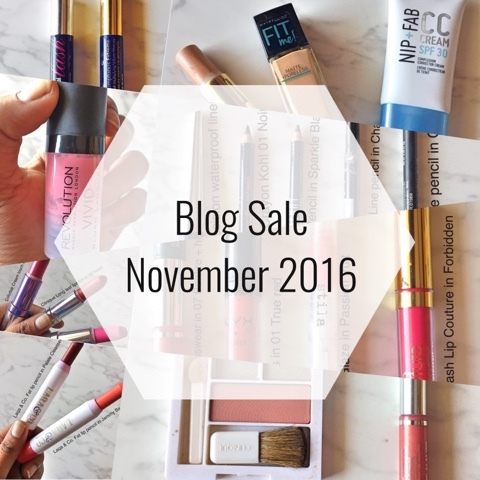 Do let me know in the comments section below what did your recent beauty haul consist of? Also, have you ever tried Aplava.com before? Nice review. Hearing a lot about this platform but still haven't shopped from here. Hopefully soon! That's a really nice haul Rajshree. I recently checked out the site and while I felt that the brands they carried were limited some of the features offered by the website were really good. I'm yet to try this site.Nice haul. I too shopped from them. Good service. Thanks for the detailed review of Aplava, I have heard a great deal about them. I'll try it out soon.